Mansoon haveli offers exquisitely decorated spacious air conditioned bedrooms with the facilities like satelliting LCD T.V., APBX and direct telephone. 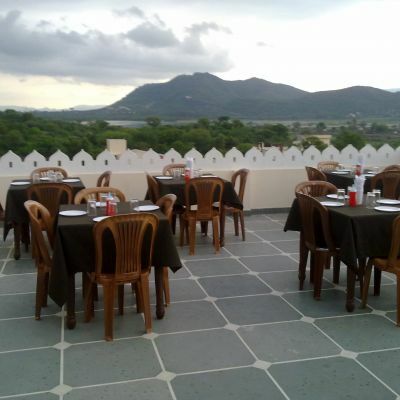 The rooftop restaurant provides a wide range of excellent food and an incredible, uninterrupted panorama over the lake and the city to the distant aravali mountains The restaurant gives a view of sunrise and sun set. These combined with the professionalism offers the best of services and value for money. Coffee Shop/Cafe, Security Guard, Disabled Facilities, Parking, Complimentary Newspapers in Lobby, Wedding Services, Backup Generator, Breakfast Services, Room Service, Beauty Services. Desk, Smoking Rooms, Climate Control, Air Conditioning Room, Internet Access, Iron/Ironing Board, Wakeup Calls, Complimentary Newspaper, Room Heater, H/C Water. User reviews for "Mansoon Haveli Hotel Udaipur"